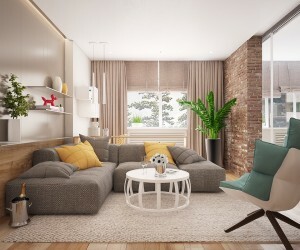 A touch of the French countryside makes a home feel like home. Synonymous with lavender sprigs, lilies and French royalty, the fleur de lis adorns its home country’s walls and so many of our home fixtures – napkins, bedding sets, and the odd bathroom fixture or two. 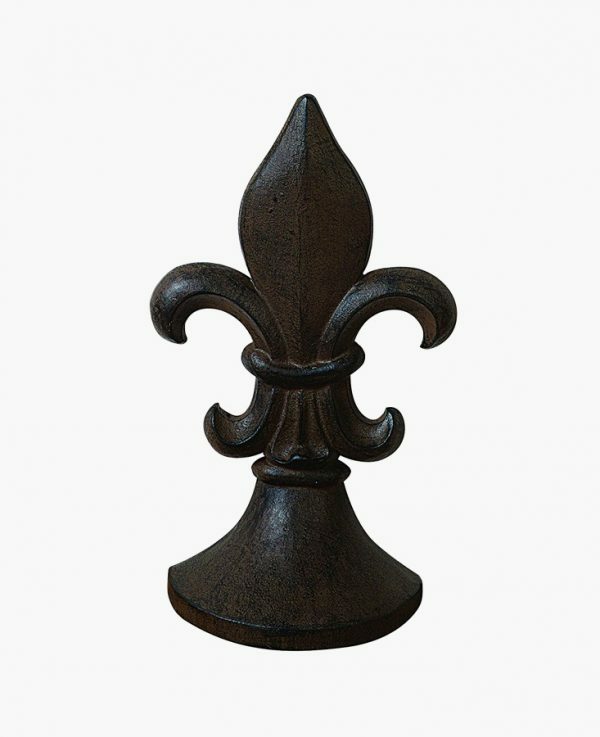 Add a splash of ‘je ne sais quoi’ to your abode with our featured range of fleur de lis home décor finds. 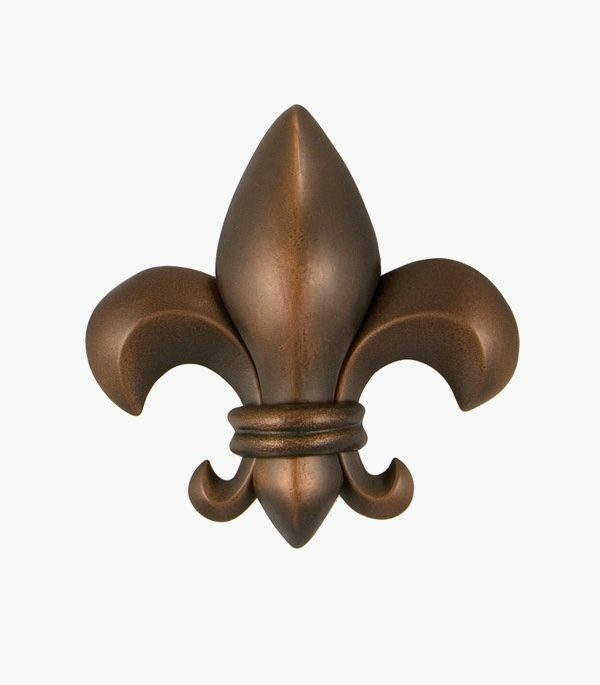 Welcome visitors to your home, with a fleur de lis wall hook to hang their coat. 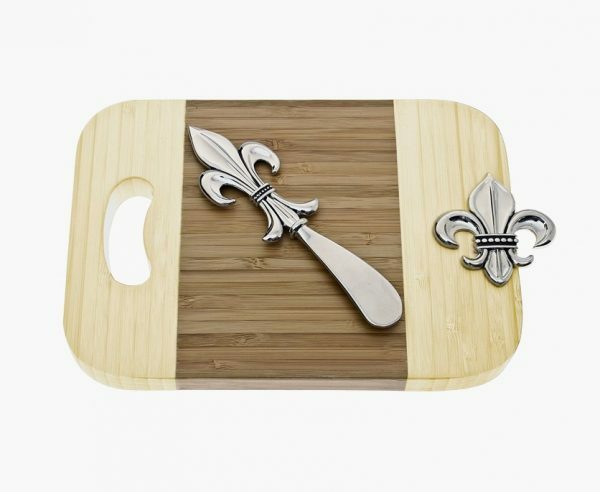 Offer them a cheese platter, with a matching fleur de lis-themed board and knife. Inhale French quintessential culture with the feel of fleur de lis. 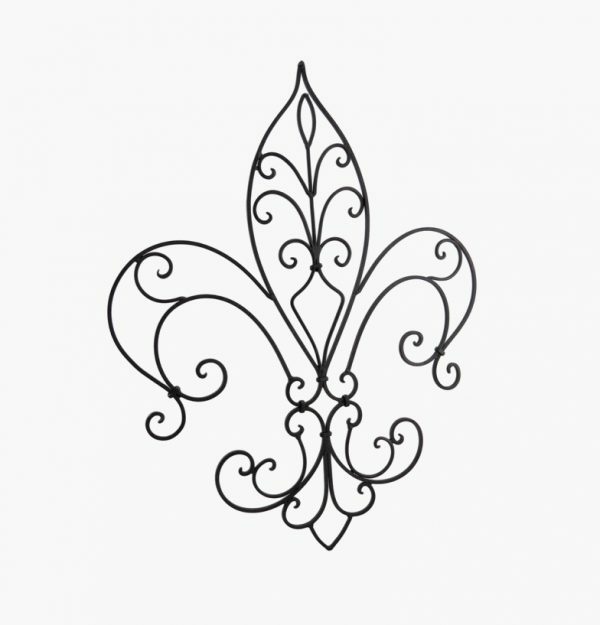 Ornate Fleur De Lis Decorative Wall Hanging: Create an entrance for your home, with this metal fleur de lis hanging beside your porch or front doorway. Its elegant metal sits astride indoor or outdoor walls, for an understated touch of French culture. 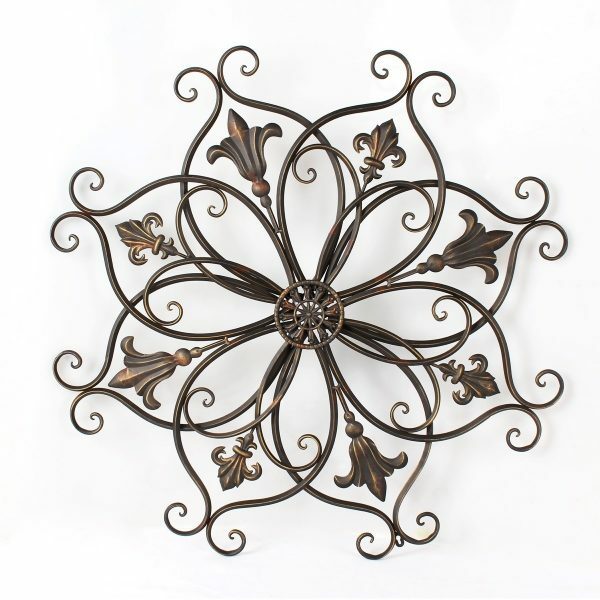 Metal Fleur De Lis Wall Decor: Made of iron, this fleur de lis is in full bloom. 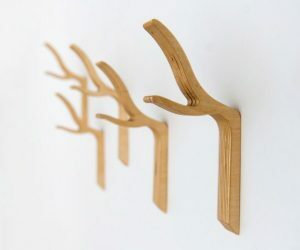 Use the hanger on its back to easily accessorize your home or garden. Fleur De Lis Mirrored Wall Sconce: Made for an entrance or dark hallway, this fleur de lis – originally a stylized lily – lights up your place with welcome. 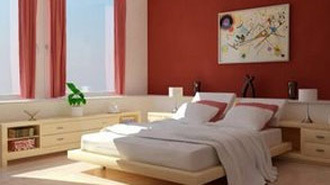 Add a candle afront its mirror to reflect French ambience across the room. 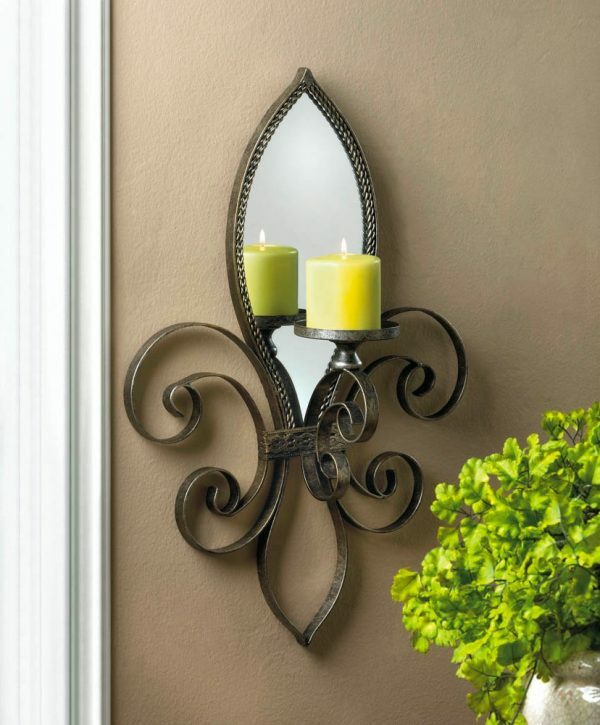 Fleur De Lis-Style Dual Wall Sconce: Have a larger space to fill? 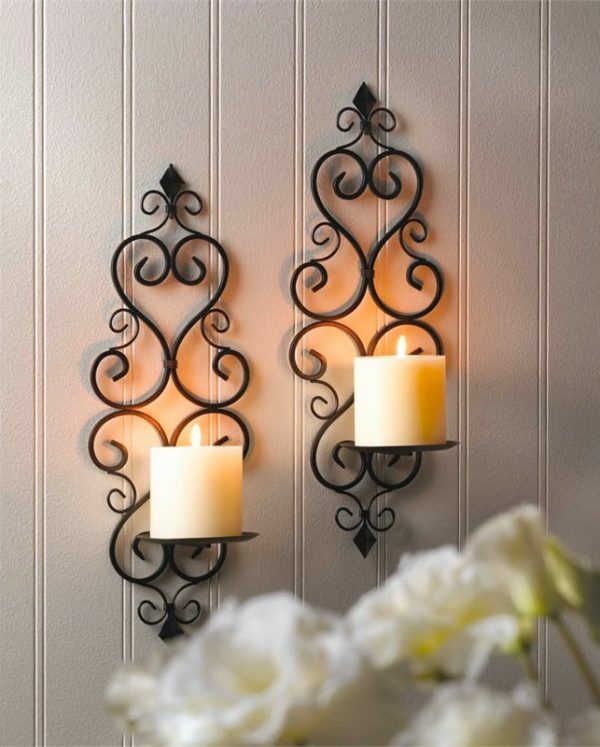 This set of two wall sconces ditch the mirror in favour of ornate iron hangings boasting two candles. 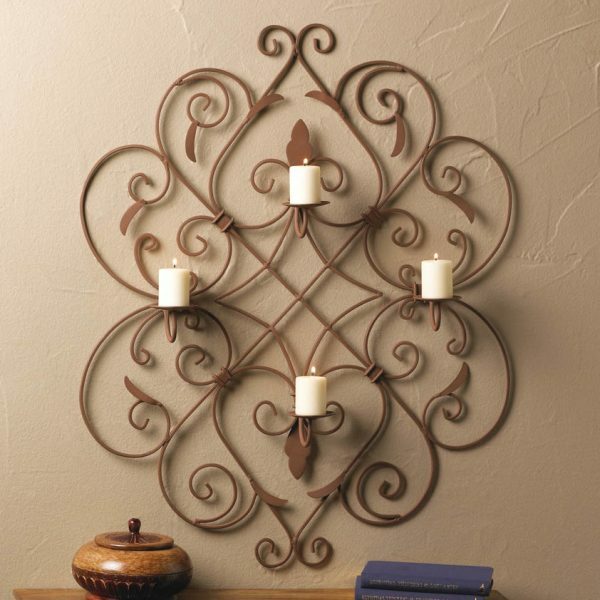 Fleur De Lis Wall Sconce For Four Candles: Also made of iron, this four-candle wall sconce goes for the whole garden. Create a romantic outdoor setting with these candles on your wall and a picnic basket on the floor. 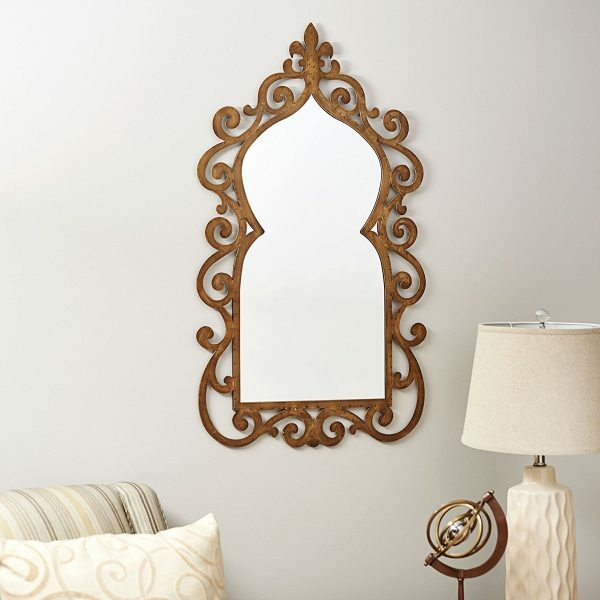 Fleur De Lis-Style Wall Mirror: This gold-painted mirror heroes the iconic fleur de lis, by placing it atop a bed of decorative scrolls. Perfect for the bedroom or living room, a spot beside bronze fittings would complete this floral dream. Fleur De Lis Table Fan: Enjoy French style in a cool, air-conditioned room. 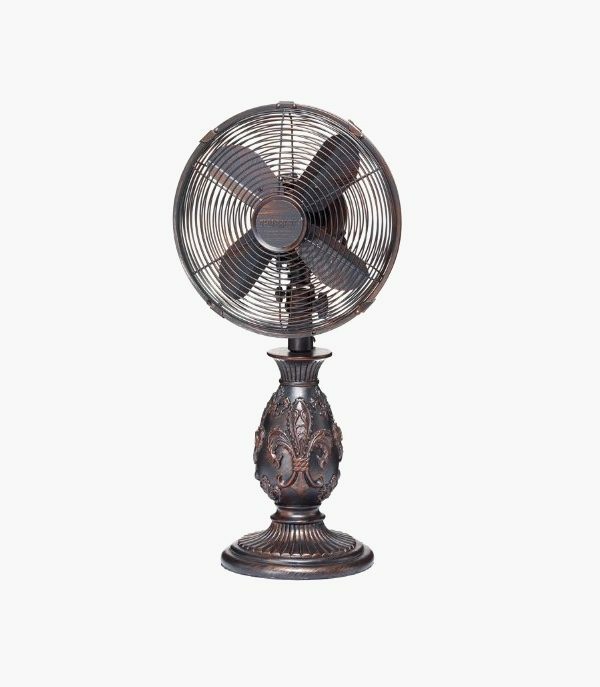 This cast metal fan with ornate stand comes with three in-built speeds and a one-year manufacturer’s warranty. 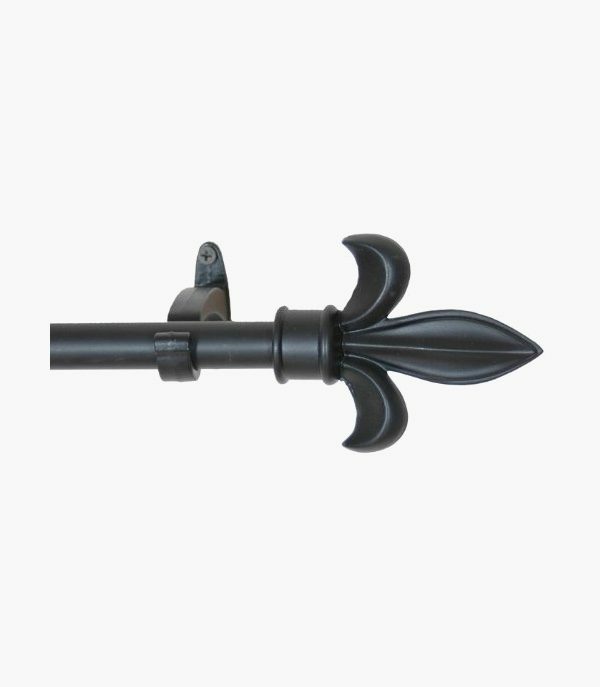 Fleur De Lis Curtain Rod: These metal rods with cast aluminium brackets are powder coated for taste and durability. Hang your paisley or taffeta curtains upon their steely frames, for a household staple with an edge. Fleur De Lis Curtain Hooks (12 pieces): These American-made hooks make the modern shower curtain look contemporary. 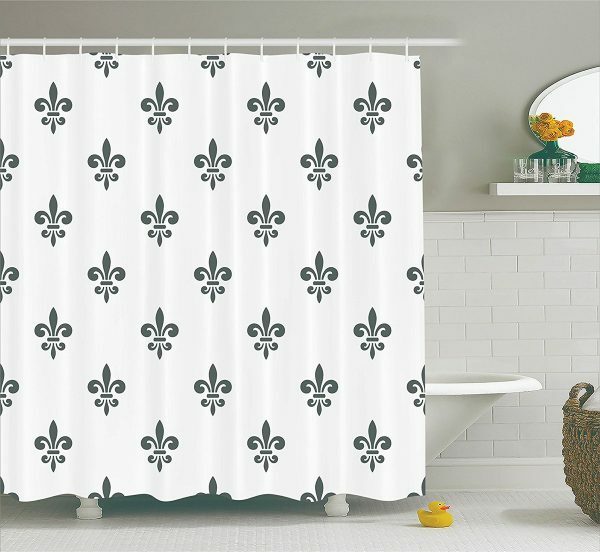 Attach each one of their 12 fleur de lis above your bath, for a French twist at shower time. 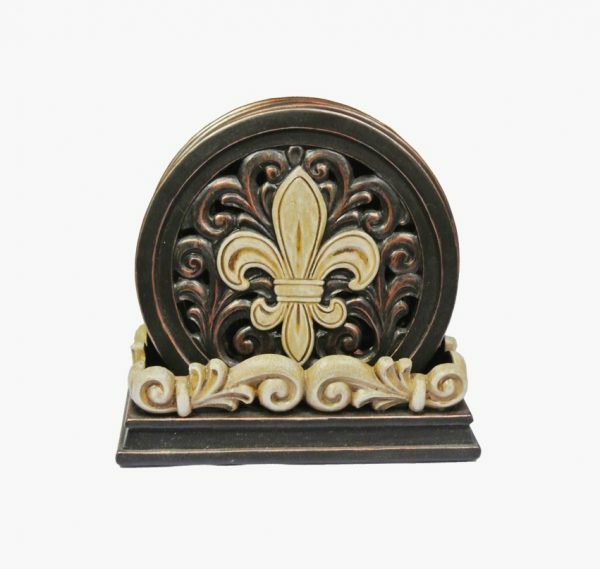 Cast Iron Fleur De Lis Door Stop: Keep your indoor-outdoor flow flowing, with an iron door stop in the shape of a fleur de lis. This fifteen-inch gem is a perfect example of decorative door stops for the antique-feel home. Fleur De Lis Door Knocker: Let guests knock your door in a time-honoured tradition, with this stylish door knocker. Made of nickel with a bronzed patina façade, your doorway emblem looks the same as the French royalty’s. 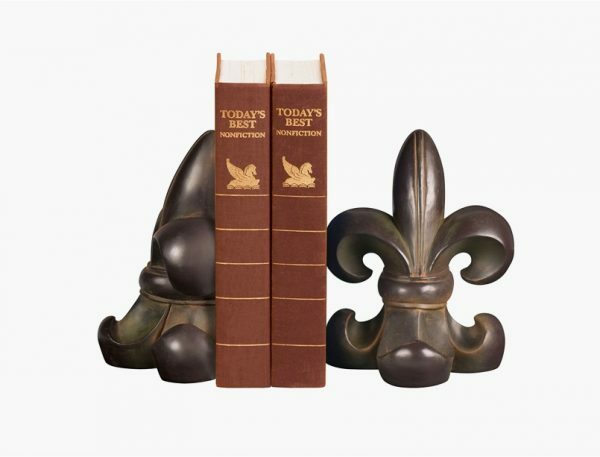 Fleur De Lis Bookends: Leather-bound books make a grand scene, surrounded as they are by these sterling fleur de lis. Felt-bottomed and polished to perfection, these unique bookends protect your bookcase from stains, and your books from falling over. Antique Fleur De Lis Box: Lightweight resin pairs with a gold finish to hold your jewellery, trinkets or house keys. 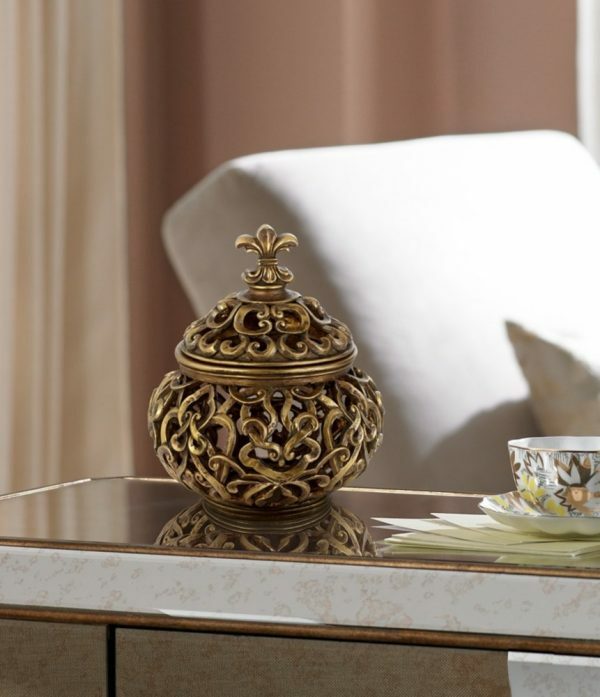 This ornate box could even act the sugar cube jar for those desiring a royal finish. 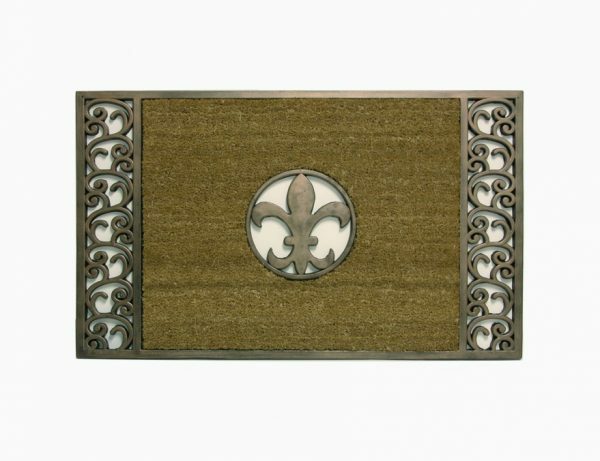 Fleur De Lis Framed Doormat: Make the fleur de lis the literal centre of your doorway. These framed, unique doormats use coil fibres to scrape away dirt, and rubber backing to avoid rectangular deck stains. 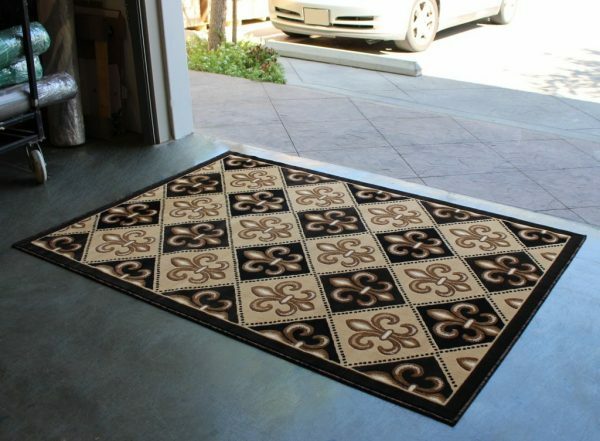 Fleur De Lis Rug: The fleur de lis can protect your carpet against visiting children. 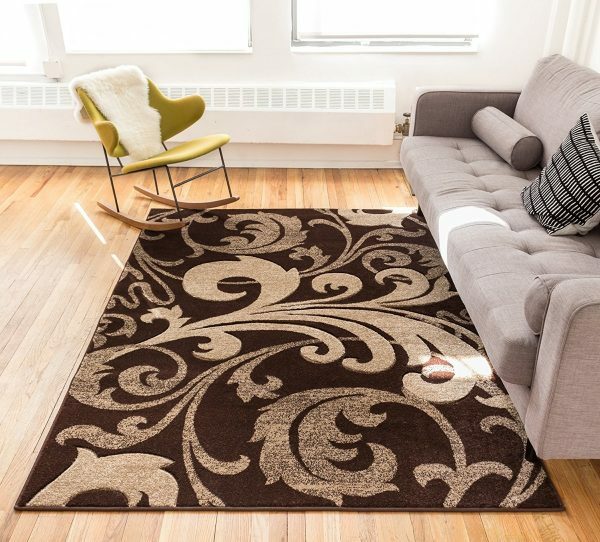 Incorporating black, brown and beige tones, this Scotch-guarded rug repels stains whilst remaining scandalously easy to clean. Vintage Fleur De Lis Pattern Rug: Want a French carpet made in Turkey? 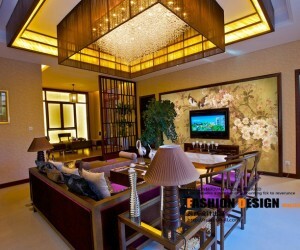 This fade-resistant design was loomed with local materials, before ending up afront the couch. 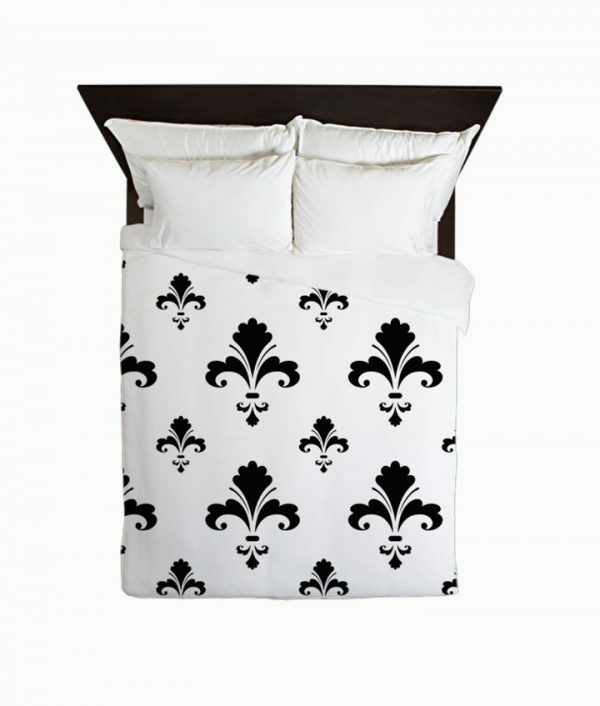 Fleur De Lis Bedding Set: Act the queen with this bedding design in your monochrome bedroom. Simply patterned, this bedding set allows your choice of two types of finishes, for a comfortable night’s sleep reminiscent of France. 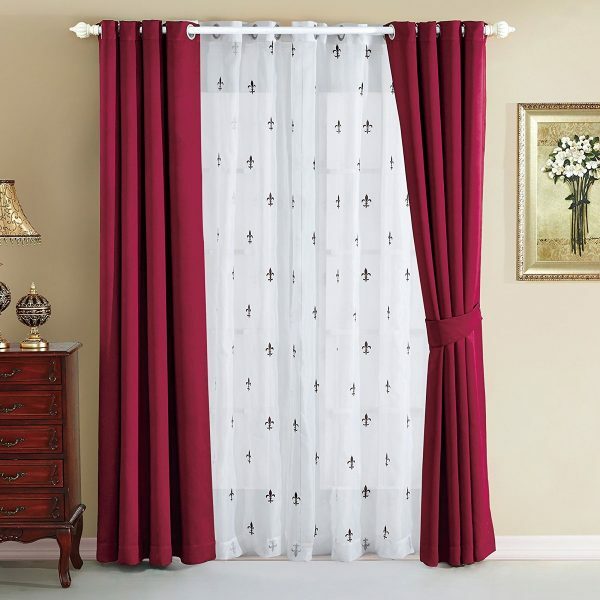 Fleur De Lis Window Curtains: Complete the look with matching voile and framing curtains in your choice of colour. This six-piece set, which boasts a voile curtain and two drapes for each window, ensures your bedroom’s enclosed from light and sound. Fleur De Lis Bath Shower Curtain: Extend the look to the ensuite, with these grey and white shower curtains of similar style. Mould-resistant and with their own set of hooks, they fit neatly in the washing machine after bath time’s end. 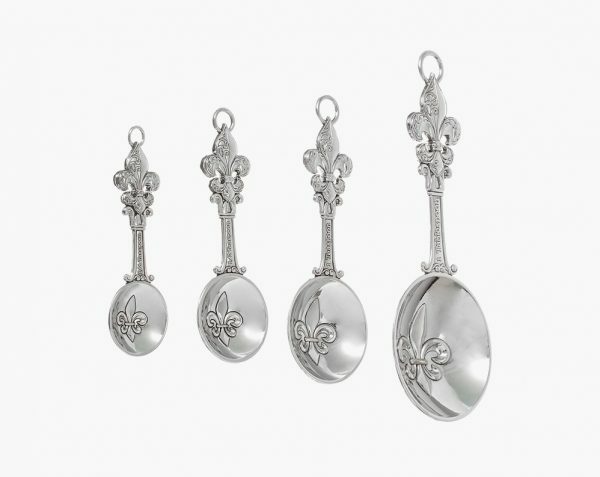 Fleur De Lis Measuring Spoons: Zinc alloy manufactured this sturdy and stylish set of Ganz measuring spoons. Engraved with a fleur de lis in each centre, they’d make a perfect housewarming, wedding or baby shower gift. 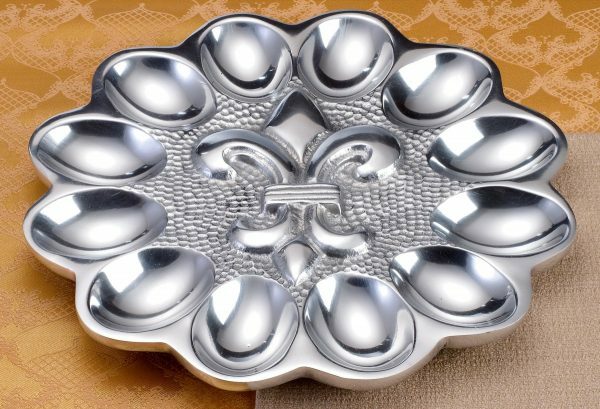 Fleur De Lis Egg Serving Tray: Ever wondered how to elegantly serve boiled eggs? This aluminium tray holds twelve eggs and a sophisticated way to serve breakfast. 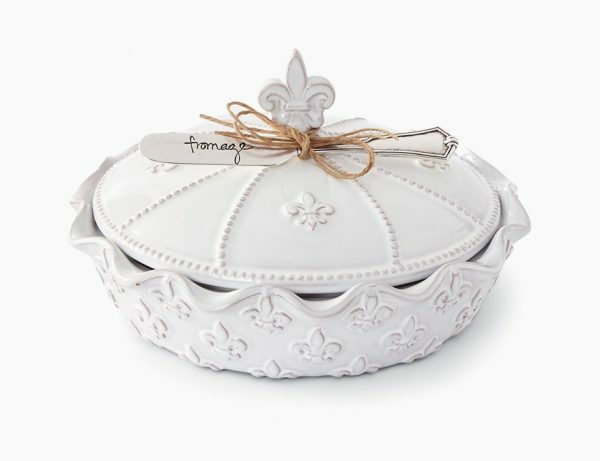 Fleur De Lis Brie Baker Set: Oven-safe white ceramic makes baked brie look good. This fleur de lis glazed dish comes with its own spreader. 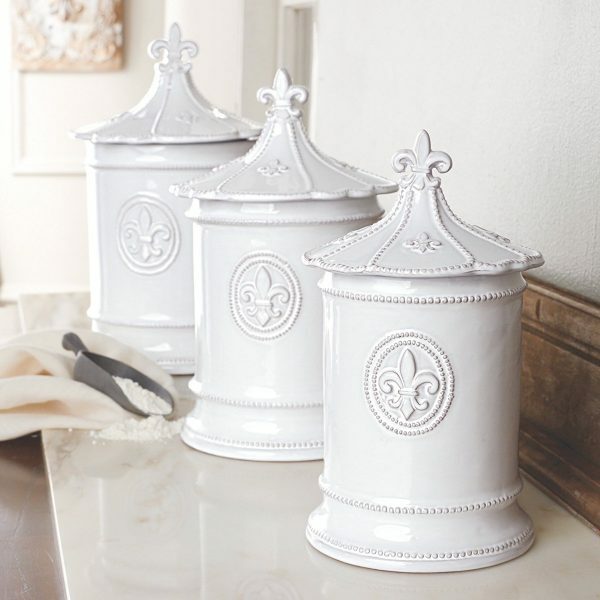 Fleur de Lis Canister (Set of 3): Store your tea, coffee and sugar in matching terracotta fleur de lis canisters. These silicon-sealed beauties feature beaded rims, turreted tops and a central French cameo. Fleur de Lis Mini Cheese Board with Spreader: Want to present your cheese in the traditional French style? This bamboo two-tone board comes with a zinc alloy icon and matching spreader. Fleur De Lis-Patterned Laser Engraved Rolling Pin: Want the professional look on a home-made budget? 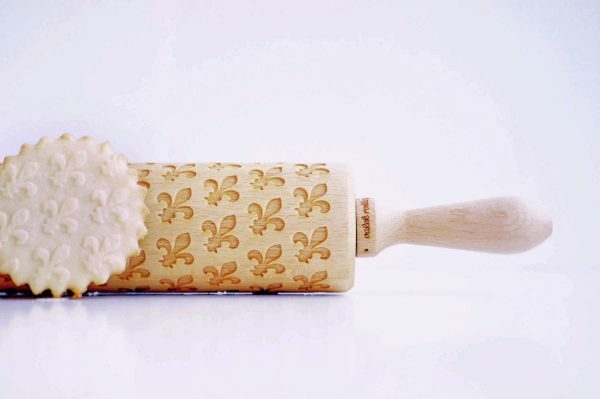 This beechwood roller imprints fleur de lis patterns on your cookies, pies and pastries. 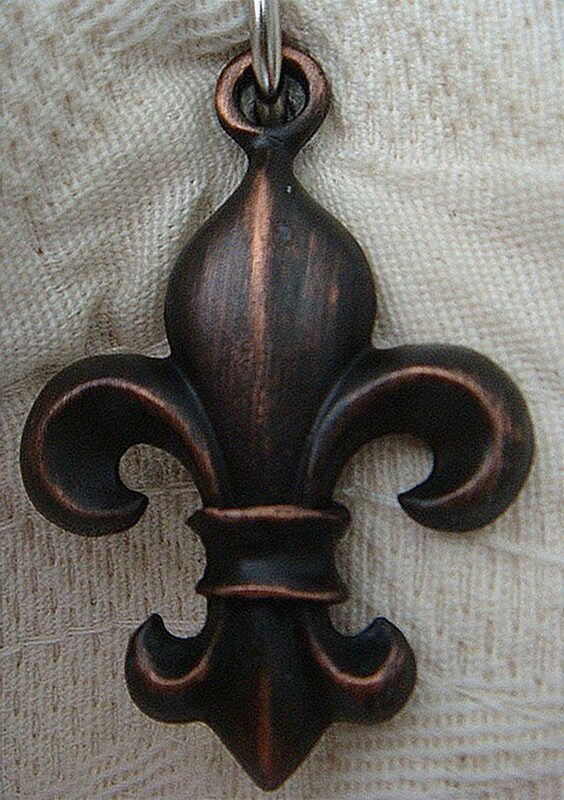 There are many more cool patterns besides the fleur de lis that you can have too. Take a look at their collection of patterns here. 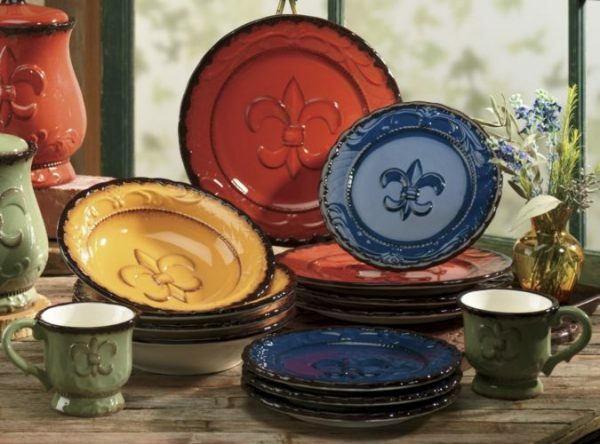 Fleur De Lis Dinner Set: The colours of Tuscany meet the emblems of France in this sixteen piece dinner set. Dinner plates, saucers, bowls and mugs comprise this scintillating ceramic collection. 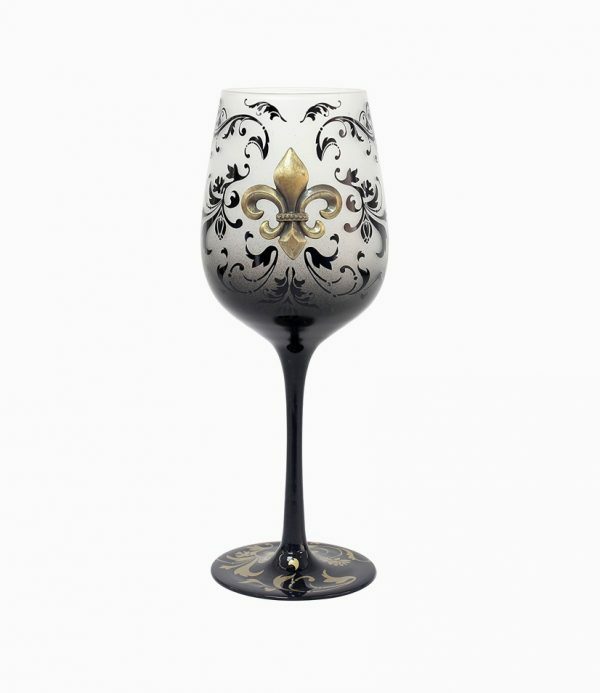 Fleur De Lis Wine Glass: Know a friend who has something to toast? Gift them these hand-painted unique wine glasses in a beautiful gift box that comes with the packaging. 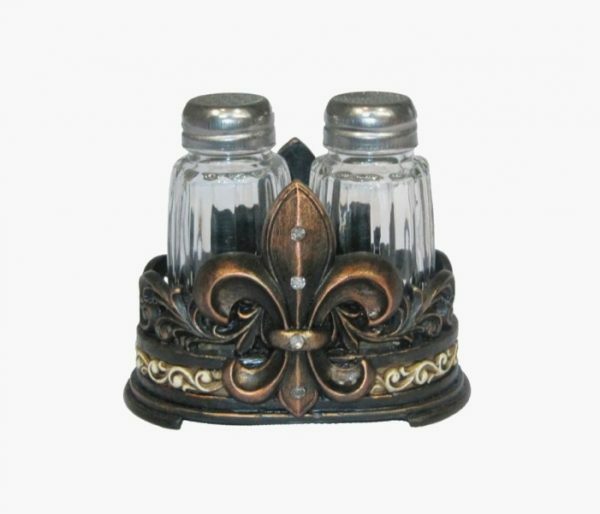 Fleur De Lis Salt & Pepper Shakers: Cradle your condiments in a fleur de lis holder, with these unique salt and pepper shakers. A couple of rhinestones snake their way up the iconic symbol, as two classic designs rest behind. Fleur De Lis Filigree Drink Coasters: Keep your beautiful coasters within easy reach, with this set of four in a carved holder. Their fleur de lis motifs upon a black surface are easy to clean and resistant to stains. Fleur De Lis Wine Bottle Coaster: Everyone needs to wear a crown now and then, and your wine bottle is no exception. 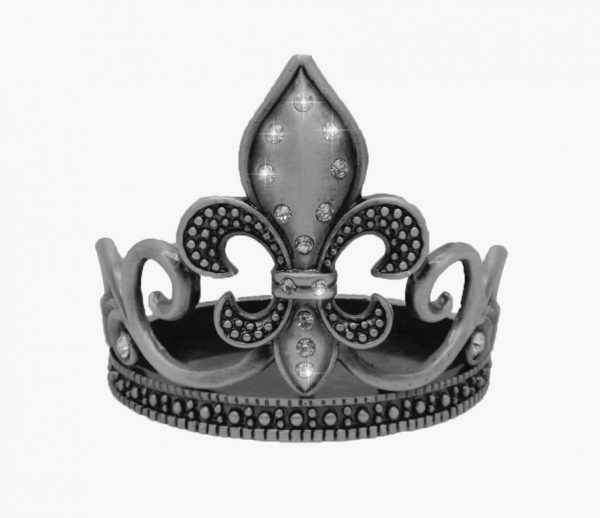 This elegant pewter is decorated with crystals, for a gorgeous fleur de lis design that protects your table. 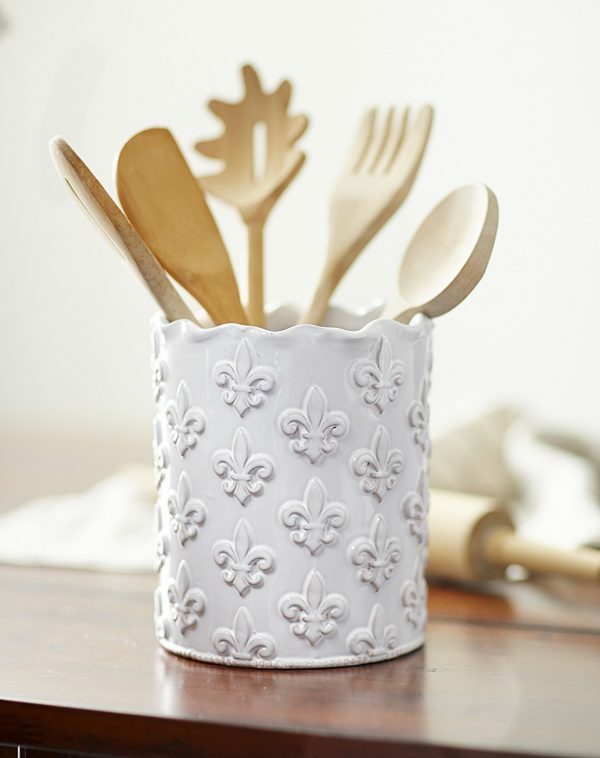 Fleur De Lis Utensil Holder: Match the brie baker and the canisters, with this white ceramic utensil holder from the same designer. Their waved edge and fleur de lis imprints create a country vibe in the middle of the city. 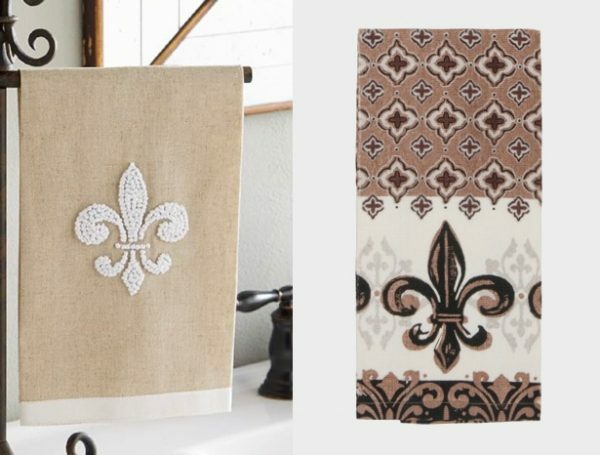 Fleur De Lis Towels: Have a few fleur de lis bathroom accessories you’d like to complement? This range of towels offers a few options for a French-style bathroom well done. Fleur De Lis Cast Iron Wall Hooks: Four cast iron decorative wall hooks prove a sturdy place for coats. 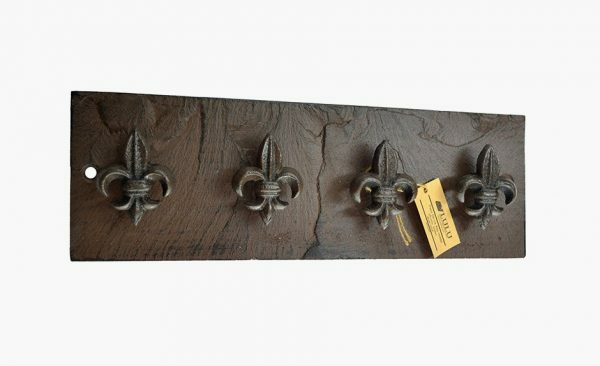 This rustic wall hanger invites your guests in, while their coats hang on a fleur de lis. 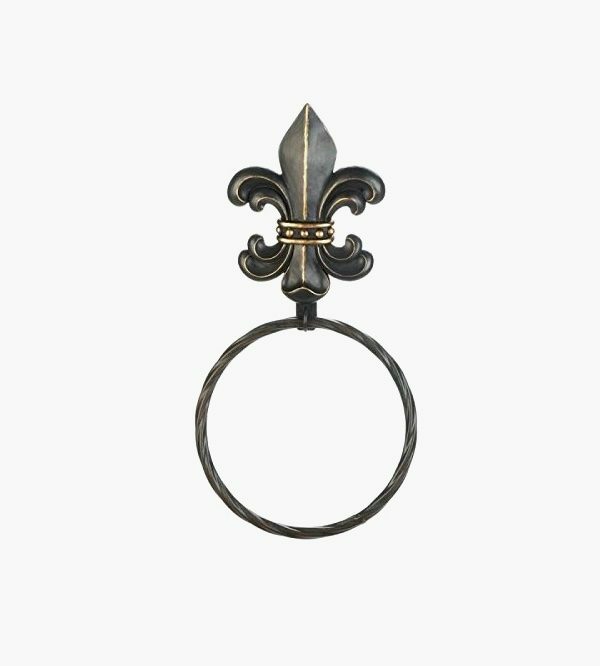 Fleur De Lis Towel Holder: Hang your towels in style, with this polyresin and iron towel ring. A nifty fleur de lis pattern affixes to your wall, for a bathroom accessory with a functional usage. 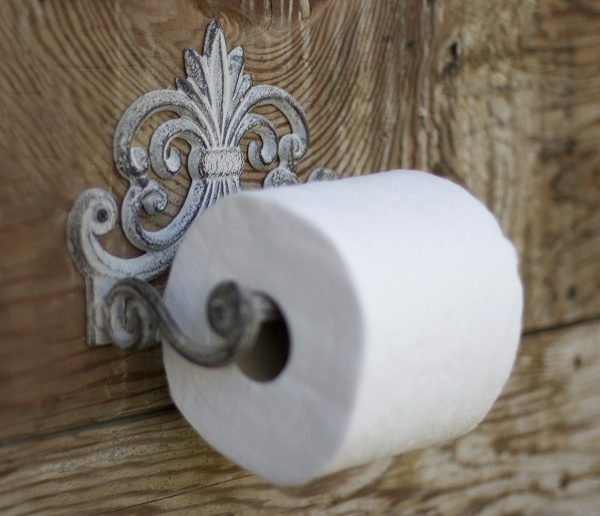 Fleur De Lis Toilet Paper Holder: These unique toilet paper holders offer comfort with a bas de relief. Affix their recycled cast iron forms to your bathroom wall for the perfect finish to a fleur de lis bathroom.